← Known Land, Foreign Tongue: Early European Attempts to Navigate the Algonquian Language. A Brief Inquiry of the Crookfall Brook and Woonsocket Reservoir Watershed. At a talk I gave recently at the Audubon Society in Bristol on “Rediscovering Places of Native American Memory”, I was approached by Tim Wynne, who enthusiastically told me of an interesting site along the Crookfall brook watershed in Lincoln, an area that is now part of the protected Woonsocket watershed. Knowing little about the area, I undertook some research before what Tim and I hoped, would be a chance to visit the watershed and locate the site he remembered. What follows is a synopsis of what I discovered to be chronicled of these lands and tributaries. Crookfall Brook was originally named Wessukottomsuk Spring, and the surrounding area has a long history, including signs of paleo-indian activity from as far back as 10,000 years ago. Traditionally, these were Nipmuc lands, later controlled and sold in the colonial period (1660) by the Wampanoag as part of what became known as the Inman Purchase. To obtain a perspective on the area itself, we can look to a couple of archeological studies conducted on sites nearby. William S. Fowler, an amateur archeologist whose work was largely published in Massachusetts Archeological Society Bulletins, excavated three locations in the “Twin River Basin” between 1950 and 1952. His findings were published in the Society’s Bulletin of October 1952. In this study, the Wenscott reservoir/West river area was identified by Fowler as a hunting site. Numerous spearheads and stone tools were found along the banks of the river and in an area close to the reservoir. There were also four stone hearths unearthed in this area. The archeologist’s determination was that he had found evidence of man’s imprint on the land as far back as 6,500 years ago at these locations. The spearheads found were those of Paleo-Amerindians who navigated the west river in search of game. These spears were their chief weapon, and other evidence of their activity were also found in the crude rock tools used to skin and clean the hides of animals. Other stone implements and the remains of “prickly clubs” were also found. By the Early Archaic period, hunters from the north had found the area, and it is their stone hearths-large and fitted with great flat hearthstones that were found three feet beneath the surface soil. Later hearths were also found in this location, identified by Fowler as having been built in the “stone bowl age” , and used for production of pottery. This relatively remote area came to be regarded by neighboring Indians as a place of refuge as English settlers extended their frontiers inland. As tribal powers fluctuated, this area became an active site of inter-tribal movement, and contact, both social and commercial became significant. Louisquisset was such an area, as its name literally means in the Nipmuc language, “at the place of meeting”. By tradition, the first purchase of these lands was made, as mentioned by Edward Inman about 1660. Around the same time, Roger Williams was granted use of a riverside by the Wampanoag sachem Alexander, running some four to five miles beginning “at the old field of Wasquadomsuk”. Inman’s purchase of “a thousand acres” is recorded in numerous references. A later deed suggests that this land adjoined the northeast portion of “wansockut hill”. Although the deed from Minion only acknowledges Inman and Mawry, others as Mawry’s brother Nathaniel, and their associates John Steere and Thomas Walling were also given a share, and thus some use of the land. In a recent walkthrough of the area, I was guided by Tim ,who as a local resident had spent considerable time in these woods as a young man. Tim had introduced himself to me at a talk given to the Audubon Society, and had told me of a significant site he remembered from the area. The land is now more formally restricted by the Woonsocket Water Authority, and we were given access by the Authority to explore the area. We walked along the bank of Crookfall brook, the area dry underfoot due to a shortage of snow and rain during the winter. Despite this, the brook had a decent current running towards the lower reservoir whose dam was built in 1883, the water rushing now between the narrow, man made channel of stone. Just beyond the dam in the woods above the river we found the site that Tim remembered. They were two stone walls, approximately eight feet high built into the hillside, with short end walls extending out from the hill. 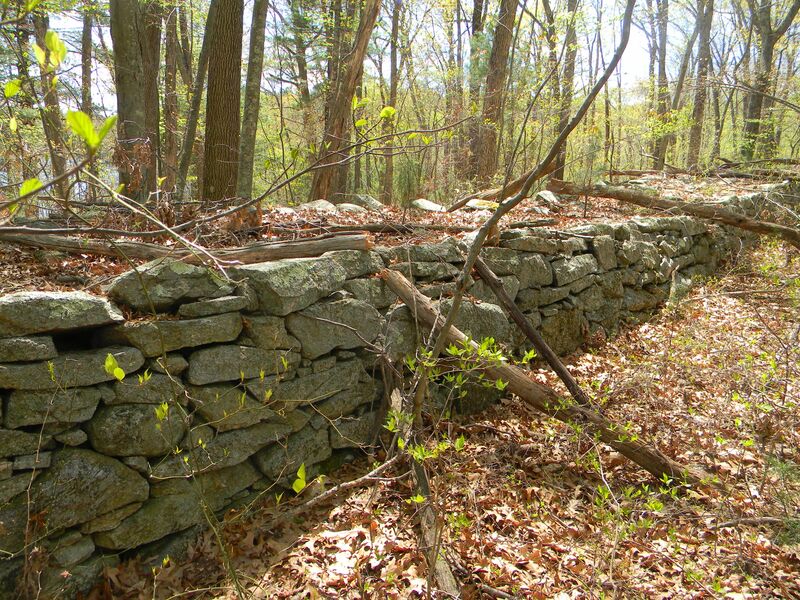 The intact walls were approximately thirty feet apart, and it was difficult to discern whether a wall along the hill connected the remaining structure. There were several large boulders at the base of the hill, and other evidence might lead to that conclusion if an historical archeological study was conducted. Just a ways down from these walls we found a more formal foundation of the same height open to the river. The walls were well formed with fieldstone and in some areas packed with smaller stone or grouted, indicative of 18th and 19th century yeoman masonry. 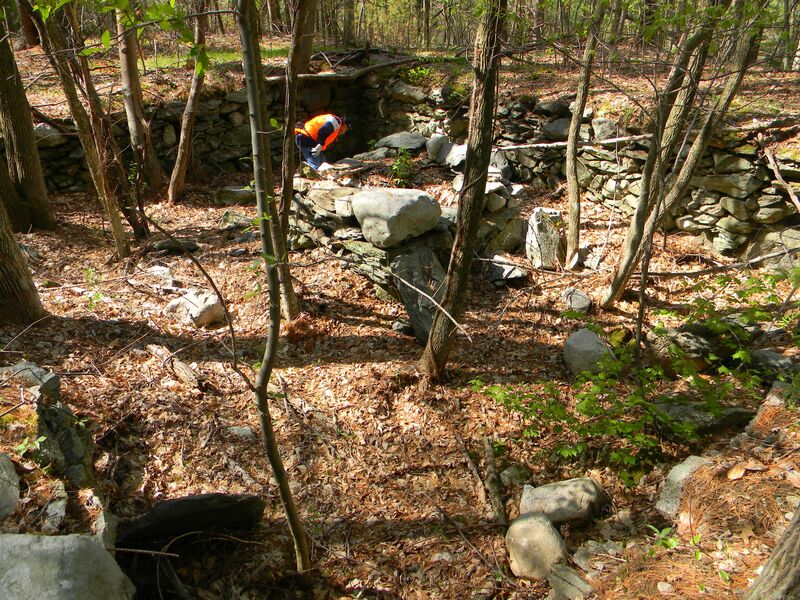 We walked uphill and backtracked toward the reservoir, in the narrow corridor of woods between Crookfall brook and Interstate 99, finding two more well preserved foundations in close proximity to each other. These contained central chimneys and are indicative of dwellings constructed in the 18th to early 19th century. Again, a formal study might find that these dwellings were in use at least part of the year alongside the brook, and further lead to speculation that the nearby structures, including the older, of which the two walls remain, might have been a stable of sorts for the horses that brought people out from the nearby farms. Close to these foundations were found two circular, ground level mounds approximately twenty feet apart in a straight westerly line. Given the proximity of the foundations, these are likely the remains of wells. 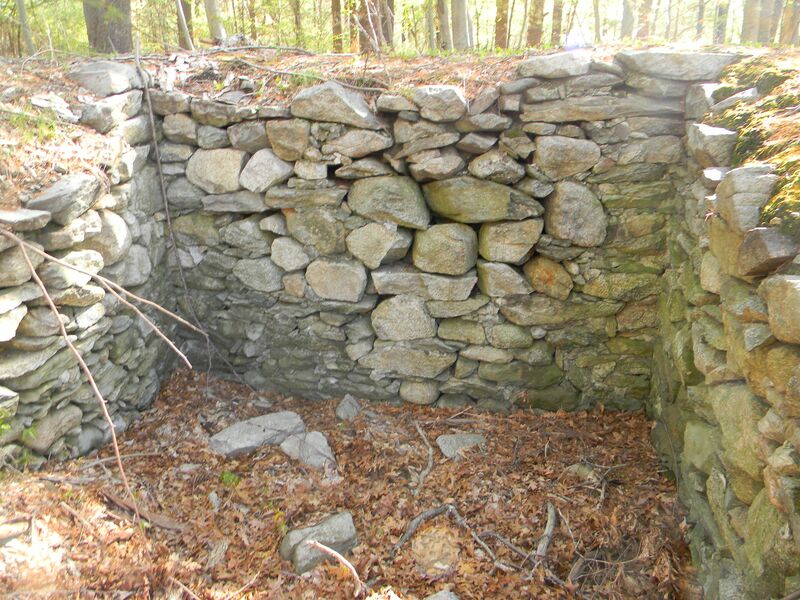 Tim and I were also given access to an area alongside Reservoir number 3 by John Beauchemin, the Water Supply Inspector for the town of Woonsocket who with other Water Authority employees, had an avid interest in a structure found in the area. John showed Tim and I a video from his cellphone of a long wall that extended parallel to the reservoir for a long distance. John also told us of a set of foundations we would find close to the end of the wall. He guided us out along the an access road and when we stopped in an area below a recent housing development, he instructed us to climb over a stone wall and head through the woods toward the southern bank of the reservoir. Tim and I headed in, and soon enough found the wall, a good four feet high, lain with uniform stone walls on either side and approximately five to six feet wide, extending to the east and west as far as the eye could see. 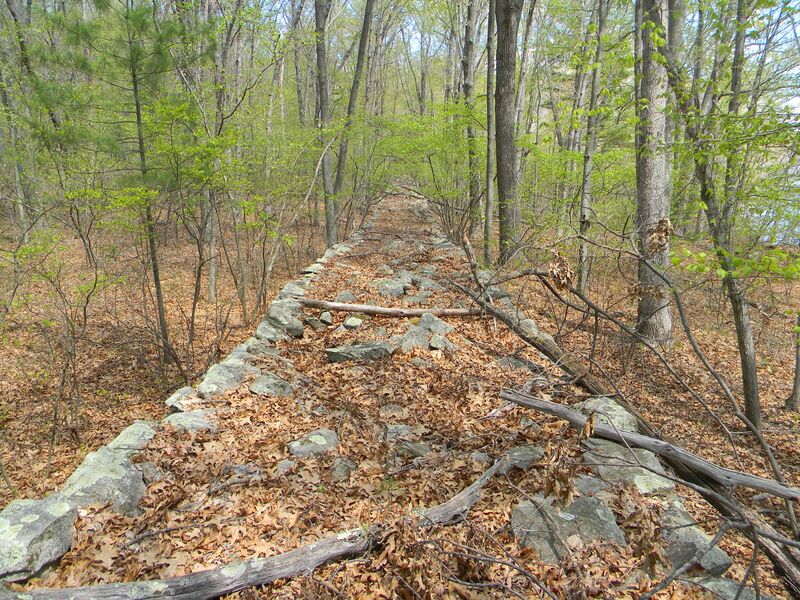 It was apparent to me that this was an elevated roadway, built no doubt, to traverse goods and materials to and from the sites we would find near the south western side of the reservoir. We took a moment to study its straight path through the trees, a few blow-downs crisscrossing the road, and young pines now two to three feet high, emerging from the topsoil beneath the stones lain for the surface. We headed back to the road to find the path Rob told us would lead to the foundations, and in a short time were heading down the well-worn ATV route that wove through the woods toward the reservoir. The first foundation was some distance from the water, with the remains of a sluice built with fieldstone still intact that extended underground towards the reservoir. There were also, two granite columns nearby, standing four feet apart in front of other remaining walls as though this might have been a formal gateway. Nearby, somewhat closer to the water were the remains of two other foundations. One included a large wall built into the hillside, and the other a small structure with two sluices leading to the foundation. 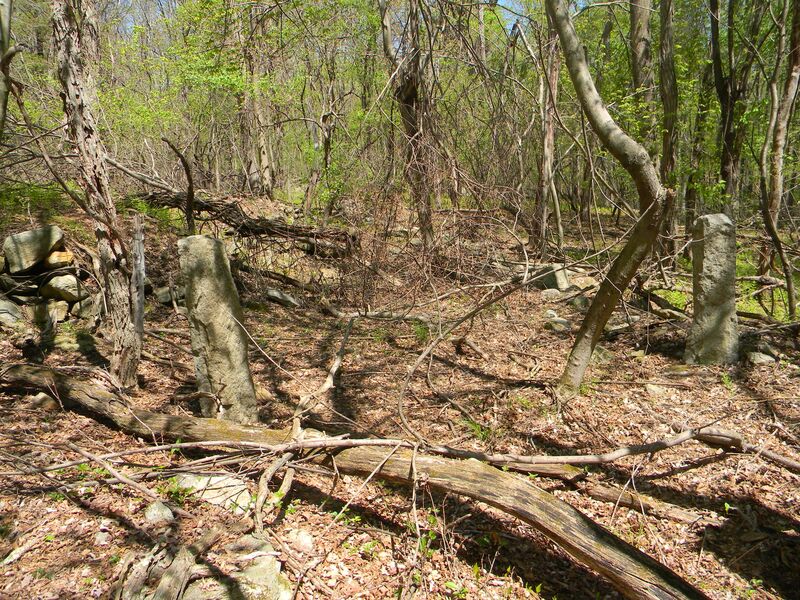 Judging by a reading of the present landscape and the likely connectivity of the elevated roadway constructed nearby, it seems that these are likely the remains of a saw mill that was active well into the 19th century, transporting lumber from the mill to the nearby farms and perhaps a market beyond. It is also possible that these separate foundations mark a gathering of separate enterprises within a compound, though an historical archeological study would have to be conducted to confirm this speculation. More historical research will have to be conducted as well as to who owned this land among the families and associates nearby, and when, to determine when the roadway and mills might have been in use. The walk itself, gave us a fascinating glimpse into the use of land and enterprise of these early farmers and manufacturers. Deeds, letters, obituaries and other ephemera, if it can be found, will help us to place the people on the land, and in the mills, and on the roadway; these last reminders of their lives of perseverance and hard labor. Hello, I would recommend a couple of rock pile blogs that discuss native American spiritualism and culture. I grew up on those woods. There is much more to the landscape surrounding that reservoir. Indian burial grounds and cemeteries from early 1800’s. I believe that this is the area that Judge John Mann lived at one time as his grave site was recently viewed by some people doing cemetery recovery work in the areas.